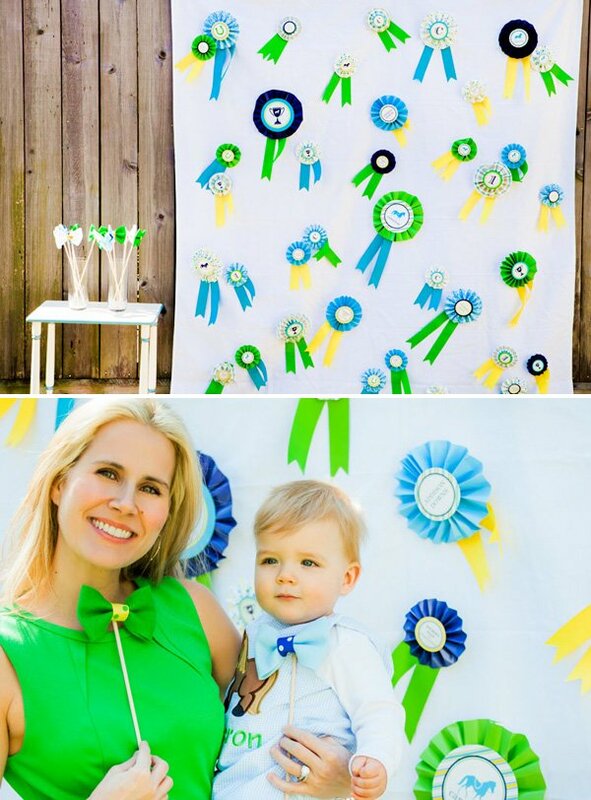 Party SHOP Member Kelly Lyden of WH Hostess designed this Preppy & Playful “Dapper Derby” First Birthday Party! 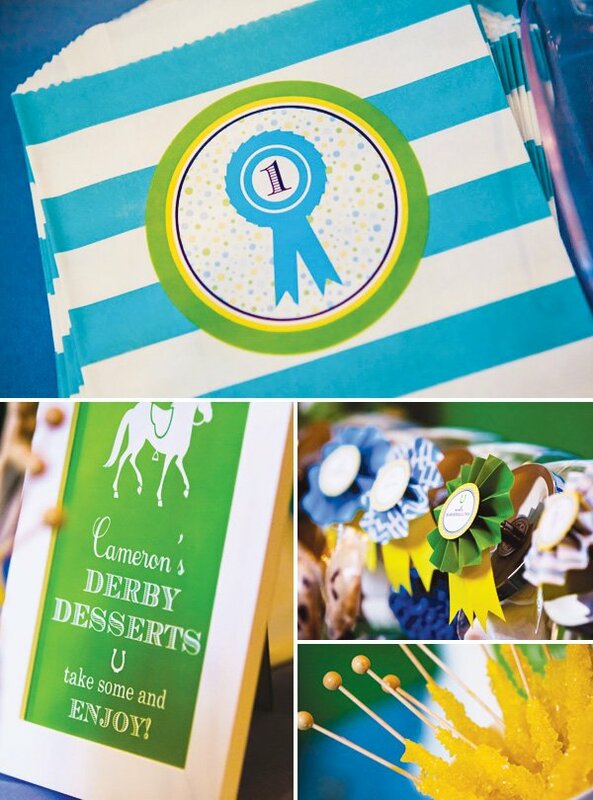 She did such a phenomenal job of running with this theme: trophy cup vases, jockey crayons, custom pony lattice pattern pillows, prize ribbon cookies and more derby inspired decorations! P.S. 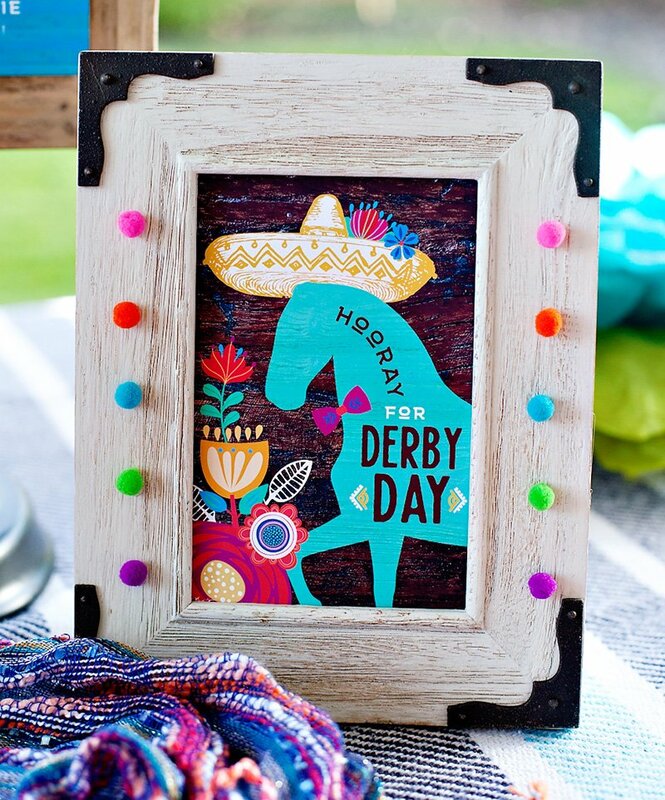 I love Kelly’s tips for repurposing items you may already have to celebrate the race on May 3-4th! INCREDIBLE trophy topped cake with haberdashery stripe and pony lattice patterns by Cakes by Gina! 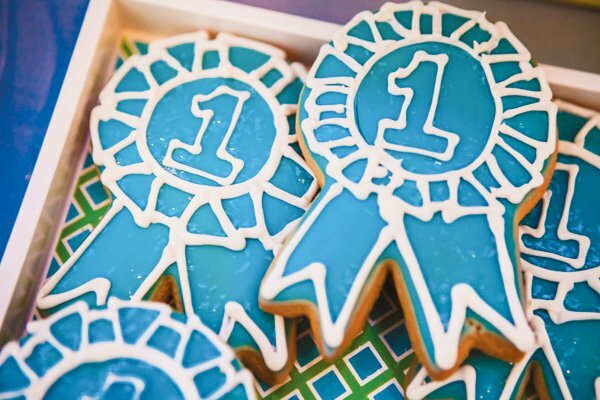 When it came time to help one of my favorite Houston clients plan her son’s first birthday party, we tossed around quite a few classic boy themes. 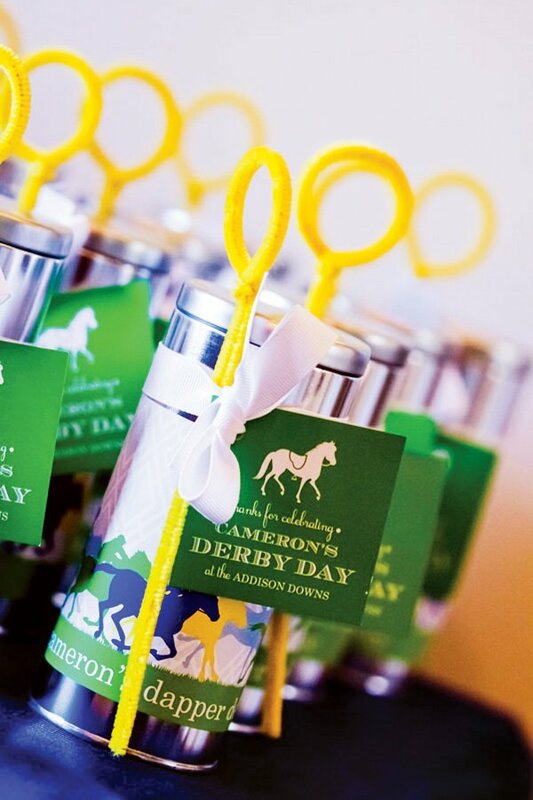 After much deliberation, a “Dapper Derby” theme was born and guests were invited to “Derby Day at the Addison Downs”. 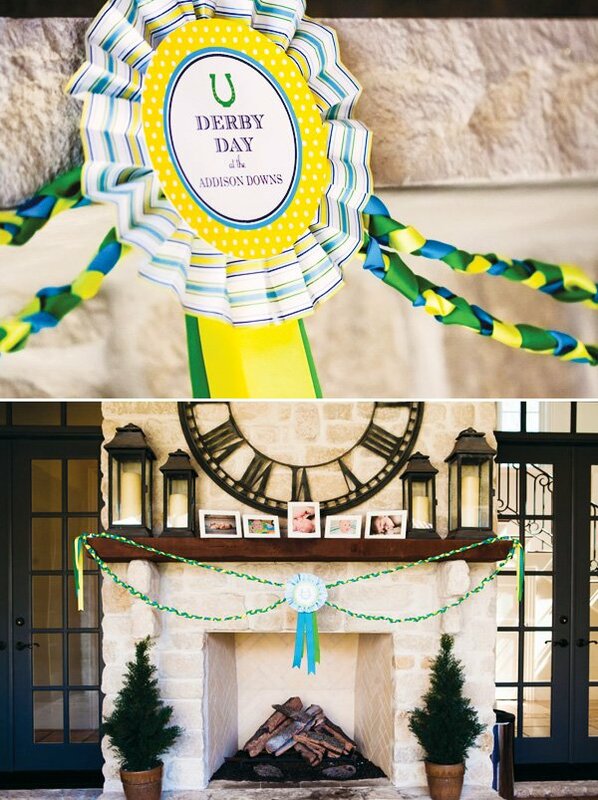 With a crisp color palette of blue, yellow and green, it was a perfect theme where we could combine “dapper” elements from a little man theme (bow ties and haberdashery stripes), #1 prize ribbons from a horse race theme, and southern traditions such as mint juleps and trophy cups from the classic Kentucky Derby. 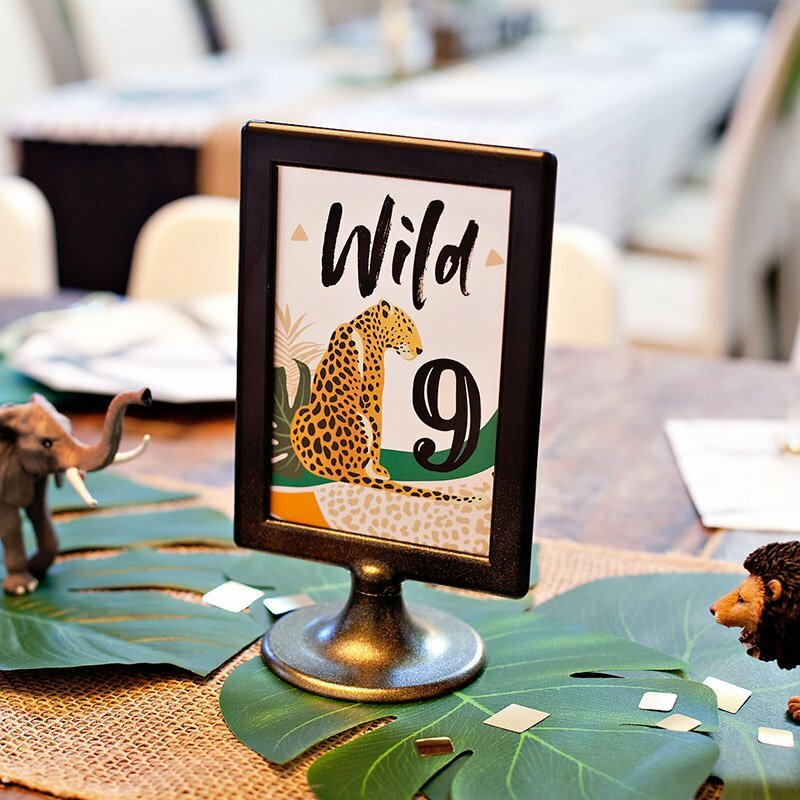 This party contains the perfect combination of southern charm and playful, preppy decor, appealing to both the adults and children in attendance. 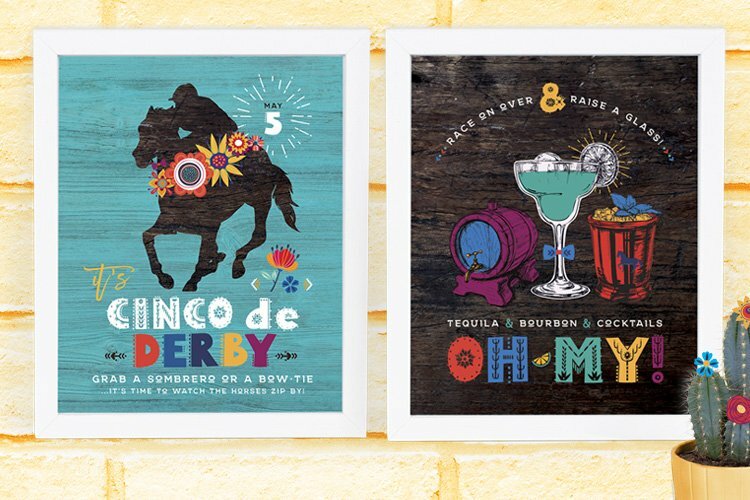 And I believe there are tons of inspiring ideas that you could use to host your own Derby party to celebrate the race on May 3-4th. 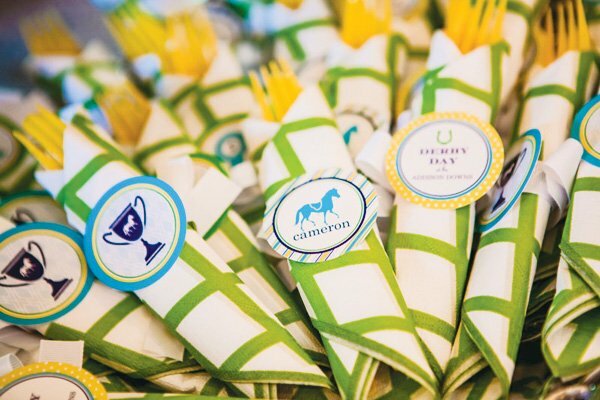 WH Hostess designed all of the coordinating paper goods, fabric and Cake Plate Clings, giving the party a cohesive look. Upon arriving at the party, guests were greeted with a balloon-lined path. 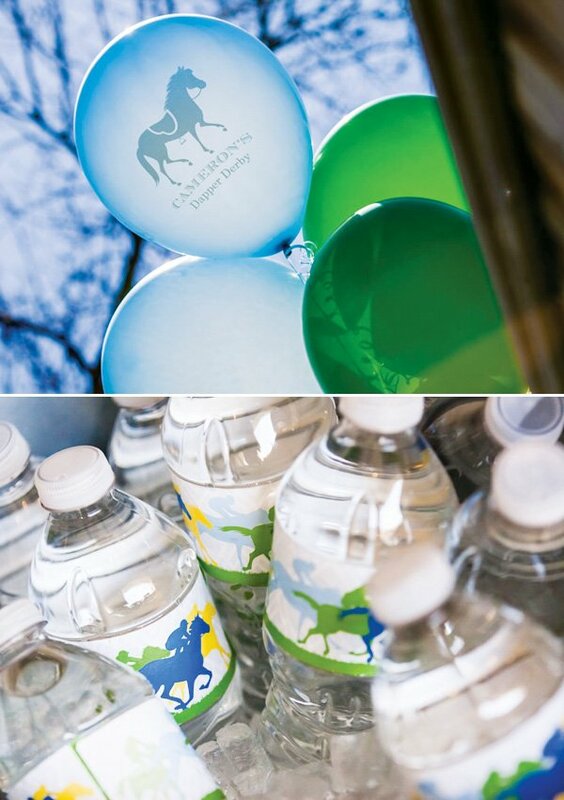 The balloons were custom-printed with our horse silhouette, and a coordinating welcome sign hung at the front door. 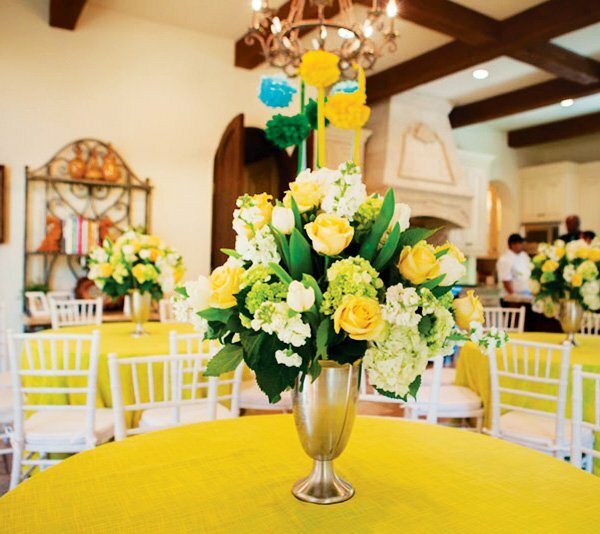 A luscious arrangement of yellow and white blooms stood grandly in the foyer, arranged in a white “trophy cup” urn. The floral arrangement was surrounded by photos of Cameron’s first year. Blue, yellow and green poms hung off the chandelier above. 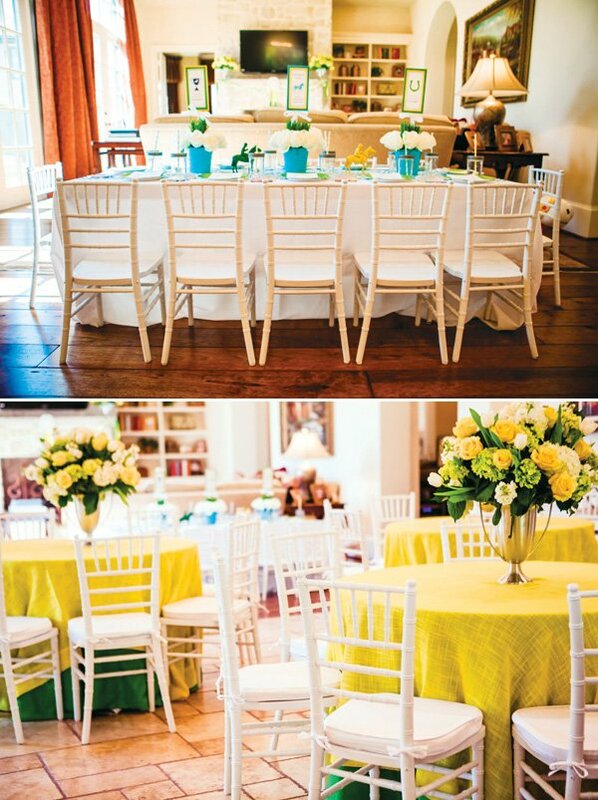 Guests made their way into the great room, where tables were set up with white Chivari chairs, layered green and yellow tablecloths, and gorgeous flower arrangements in silver trophy cups. Mini versions of the white Chivari chairs sat around the kids’ table. A custom table runner made from WH Hostess’s exclusive pony lattice fabric was edged with grosgrain ribbon and white tassel garland, and sat atop a crisp white tablecloth. Three bucket centerpieces held grass plants surrounded by roses, and coordinating centerpiece sticks featuring a trophy cup, horse and lucky horse shoe. 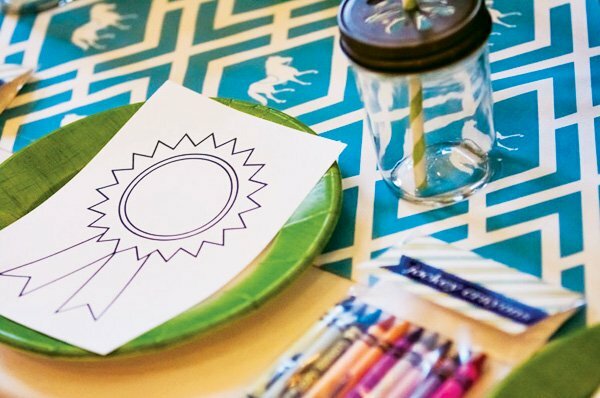 Each placesetting had a prize ribbon coloring page, along with a cello bag of crayons (the topper read “jockey crayons”), and a drink in a covered mason jar. Colorful poms hung from the chandelier in the great room, and the fireplace was adorned with julep cup floral arrangements, and a custom garland of braided ribbons and an oversized “prize ribbon”. These decorations were repeated in the outdoor living room, along with the addition of throw pillows made from our custom pony lattice and haberdashery stripe fabrics. A “trough” of wheat grass sat on the coffee table, along with mini toy horses that we spray-painted in our pop colors of yellow, blue and green. The kids were entertained with pony rides, a bounce house and an old-fashioned horse race. 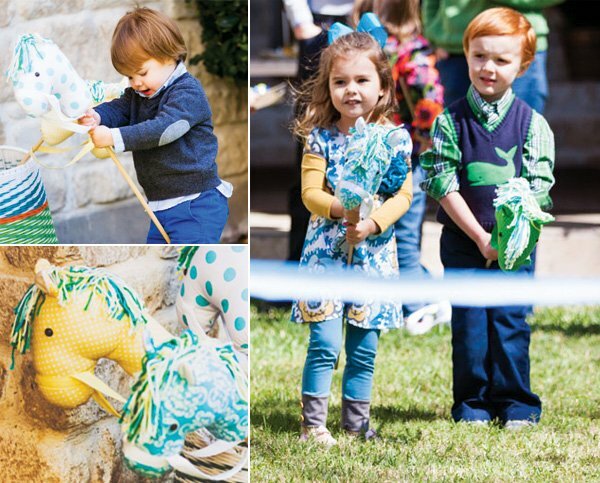 Custom stick ponies were made in the party’s signature color palette, and the kids had fun racing to the finish line! One of my favorite details of the day was the custom prize ribbon backdrop. We crafted each of the prize ribbons by hand, featuring our custom patterns, ribbons and medallions that included “C”, “#1”, “Derby Day at the Addison Downs”, etc. The backdrop hung on the fence in the backyard, so people could take photos in front of it. Felt bow tie sticks were on hand for people to use as a prop. 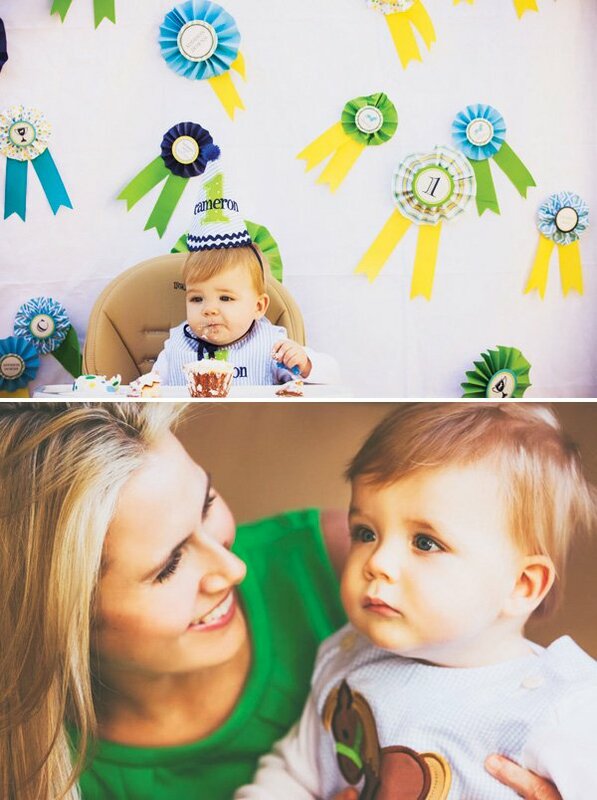 And when it came time for Cameron’s smash cake, his high chair was placed in front of the backdrop, framing his cute little face perfectly! 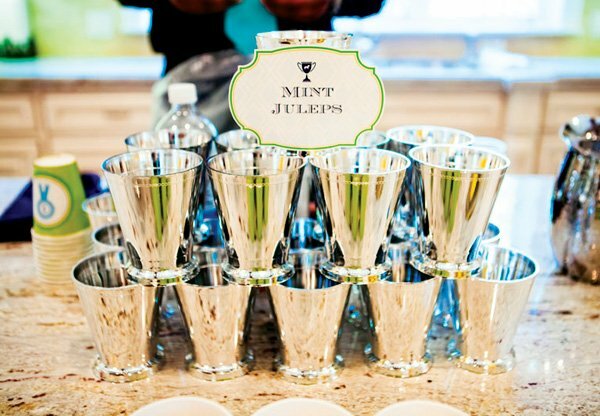 The bar was set up along the kitchen’s long island, featuring drinks served in mason jars, julep cups, and sticker-embellished cups for the kids. 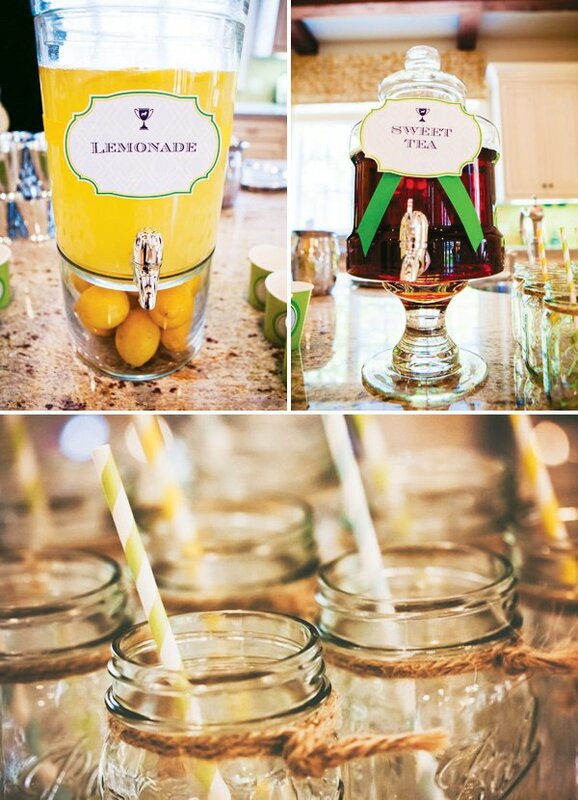 Drink dispensers labeled with custom tags held Arnold Palmers, Sweet Tea and Lemonade. 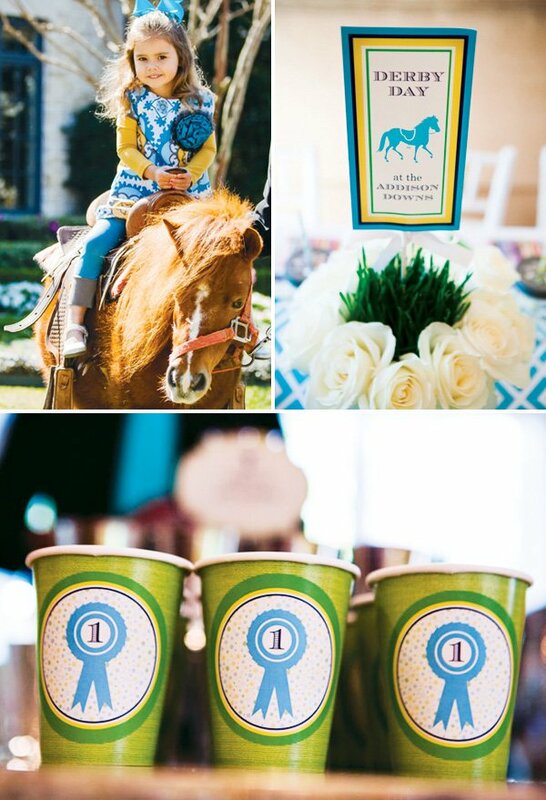 Mint Juleps were served to the adults, and water bottles with our horse race label were placed in wicker baskets for an easy grab-on-the-go during a bounce house break. The lunch buffet was set up in the dining, featuring three gorgeous flower arrangements from Blooming Gallery in modern white trophy cup urns from Z Gallerie. A Fare Extraordinaire created a perfectly southern assortment of tasty bites, including fried chicken, lettuce cups, macaroni and cheese, and mini pigs in a blanket for the kids. Silverware was rolled in a Caspari lattice-patterned napkin and our coordinating napkin ties, making it simple for guests to grab along with their plates. The dining room also held a special table for the adorable 3-tier cake from Cakes by Gina. 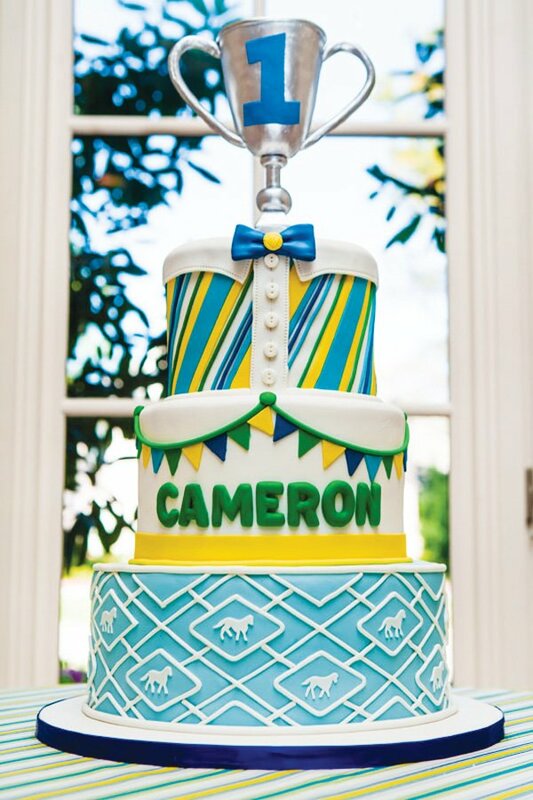 They were able to duplicate our haberdashery stripe and pony lattice patterns in fondant onto the tiers, and topped it with Cameron’s very own silver trophy cup. The table was dressed in a topper made from our haberdashery stripe fabric, edged with white pom pom trim. The cake was just the beginning of the desserts offered to guests. 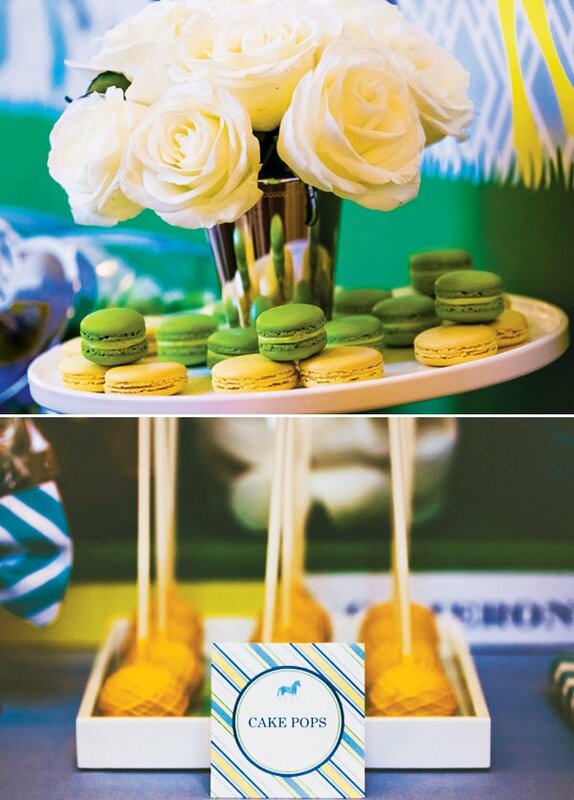 A full Derby Dessert Table held center stage and featured delicious sweets all in our signature color palette of yellow, blue and green. The table was dressed in a blue floor-length tablecloth, creating a perfect base for white serving dishes that we embellished with Cake Plate Clings in coordinating patterns. A custom fabric backdrop featured our lattice pattern and colorful horse silhouettes. A pennant banner was draped across the front of the table, and a fabric-covered riser held 5 candy jars in the center of the table. Instead of traditional candy jar tags, we created “prize ribbon” tags to identify the type of candy. 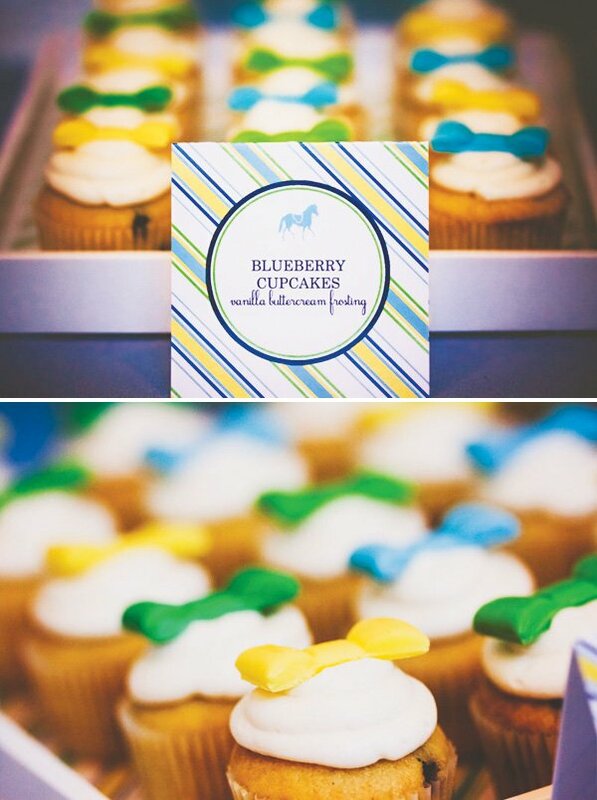 Colorful macarons, yellow cake pops and blue prize ribbon cookies were some of the favorite treats. 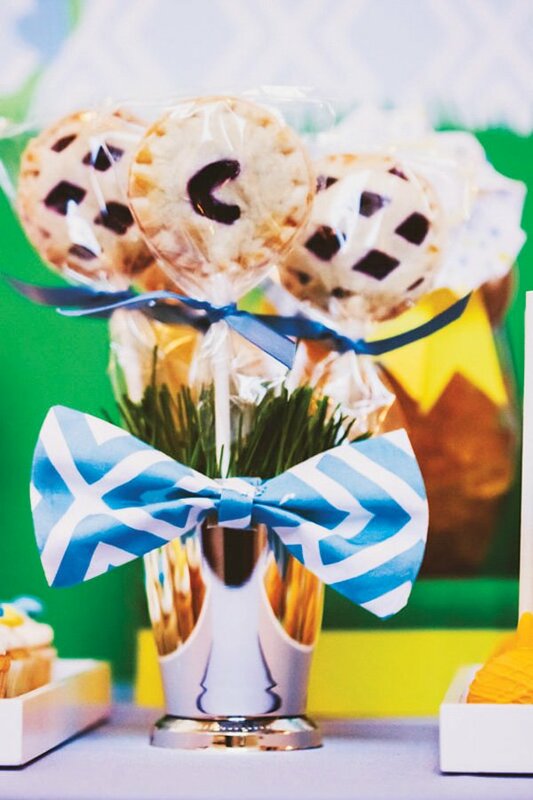 Blueberry cupcakes topped with colorful, fondant bow ties and mini key lime pies sat front and center, and as a nod to the southern theme, pie pops stood in mint julep cups adorned with bow ties. Blue-striped paper bags held our #1 prize ribbon stickers, and were available for guests to fill with candy to bring home with them. 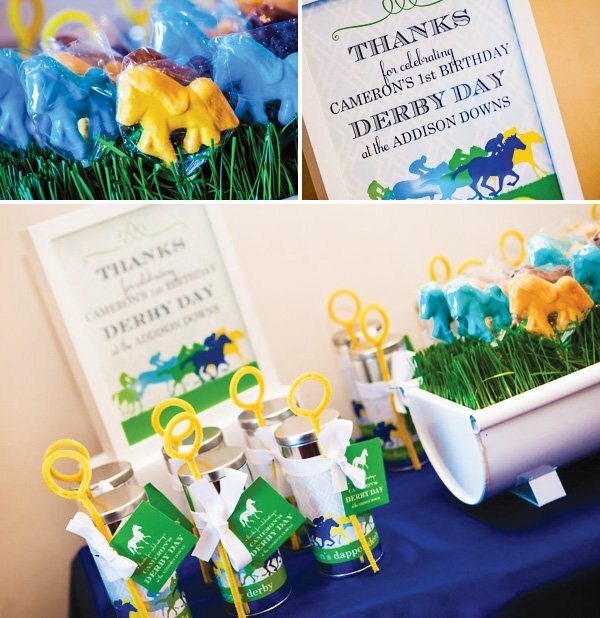 The children all received a tin of bubbles, adorned in our horse race label and tied with a green gift tag. 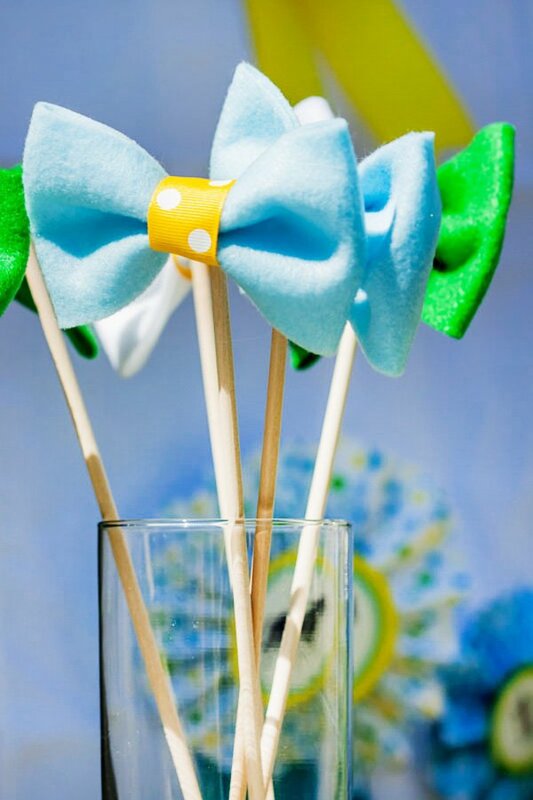 They also received a colorful horse chocolate lollipop, which were displayed in a white “trough” full of wheat grass. Signage thanked the guests for celebrating Cameron’s Derby Day. 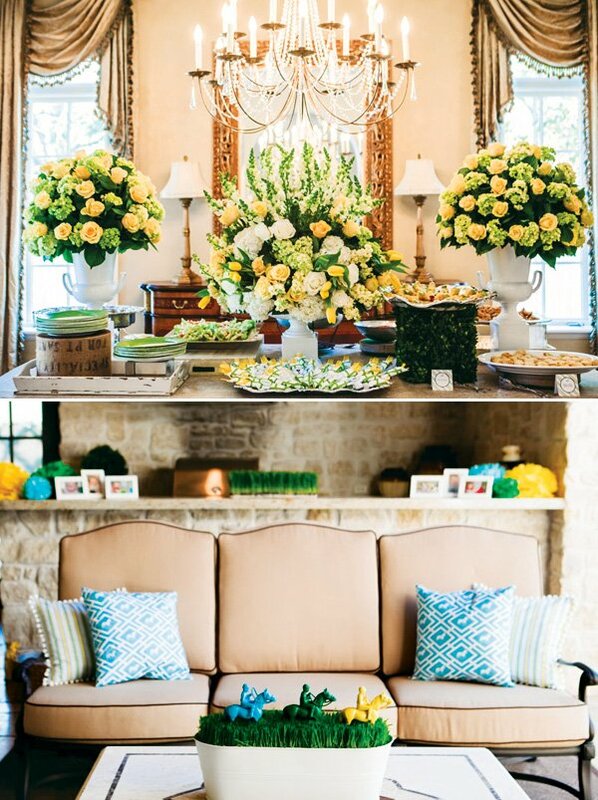 It was an amazing party with the perfect combination of southern elegance and preppy party decor. 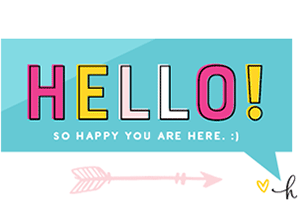 Thank you so much for the beautiful feature! 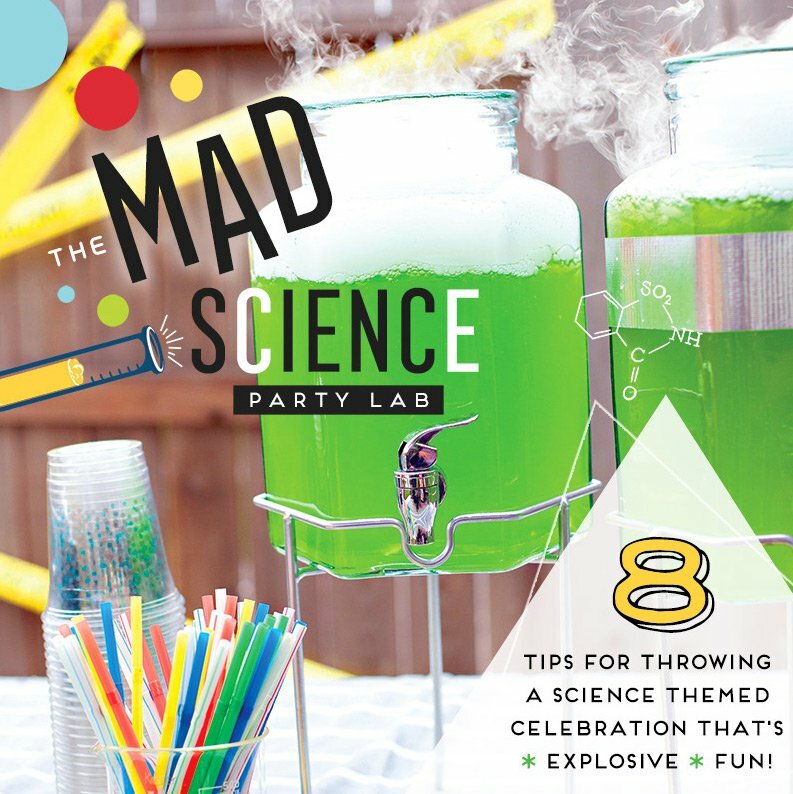 This was such a fun party to design and Cameron’s mom did an AMAZING job putting it all together! You’re welcome Kelly, you and Cameron did a fantastic job! this party is fabulous!!! You are so talented! 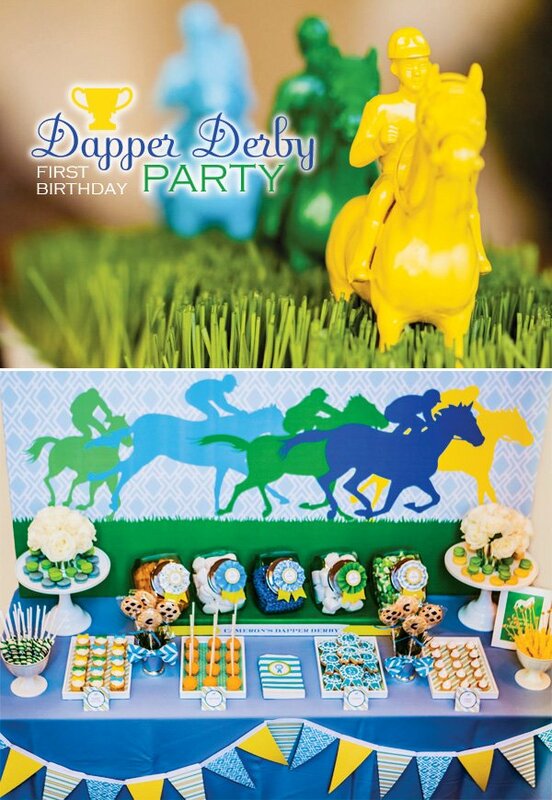 I just saw this blog…I am planning a derby themed party for my son’s 1st birthday and love your ideas! In fact- I had already purchased the same hat/bib as pictured. But…I was wondering- where did you find that cute little romper with the horse on it?!? I would love to know! Thank you! 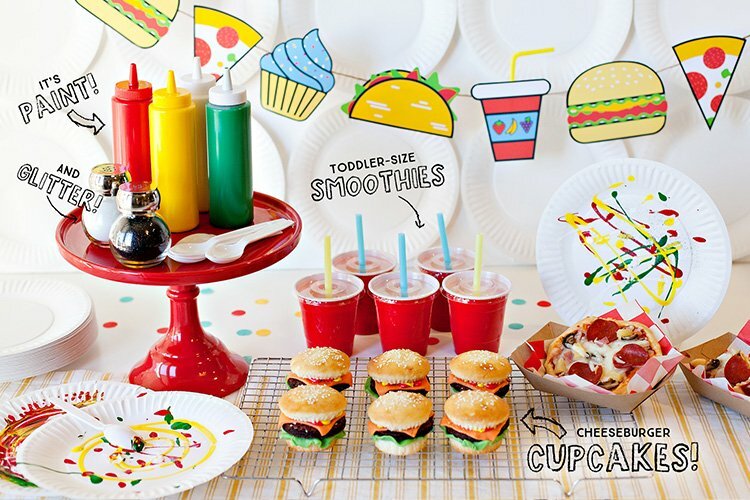 Do you have pictures of everything put together at the party? I’d love to see how it turned out but I can’t find any photos on this blog post, just links to the individual vendors. Hi Sara – Do you mean that the images aren’t loading for you at all? When I view the post I can see all the images, so I’m not sure what would be causing them to not load for you… maybe try a different browser or refreshing the page?